These are so easy and tasty you won’t go for the frozen ones again. Place the grated potatoes in a colander and squeeze out the excess liquid. Heat the oil in a large frypan. Spoon portions of the mixture into the medium/hot frypan flattening each portion slightly. Ensure that you keep the portions separate from each other. 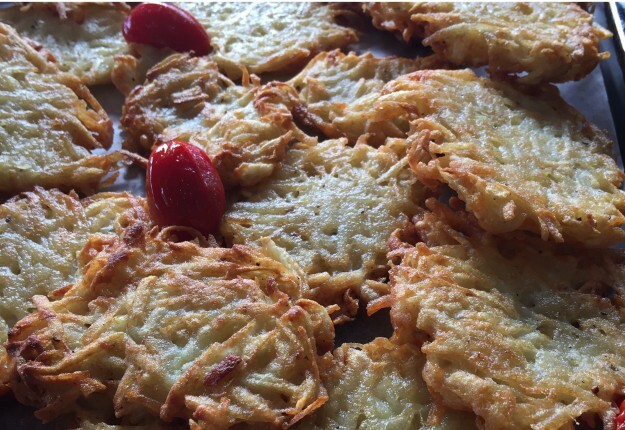 Fry hash browns until golden and flip over continuing to fry the other side until golden. Repeat until all the mixture is finished. Notes... These are great served with egg muffin, avocados, and chilli jam for a special occasion breakfast. A delicious recipe l would love for brekkie with eggs and sausages,thanks so yum! This is great, I’ve never made them but now I can! Too easy. I make these all the time..so tasty! Hashbrowns, my favourite. and yet i can’t make them so this is worth a shot. Oh wow, these look amazing! So crispy and delicious, will be making these for sure. Thanks for sharing! mine always go soggy – not sure what I am doing wrong… any tips? I was literally looking for a hash brown recipe last night! Will be bookmarking this one. Yummmy!! Will definitely try these for brekkie tomorrow! Thanks for the recipe – I’m looking forward to making some hash browns.